With Easter right around the corner, I’ve got baking on my mind as I am in charge of all of the baked goods for our family’s annual Easter supper. One of my favorite things to make is Paska bread, a deliciously dense loaf that is slightly sweet and dotted with raisins. I’m excited to share this family recipe with you! 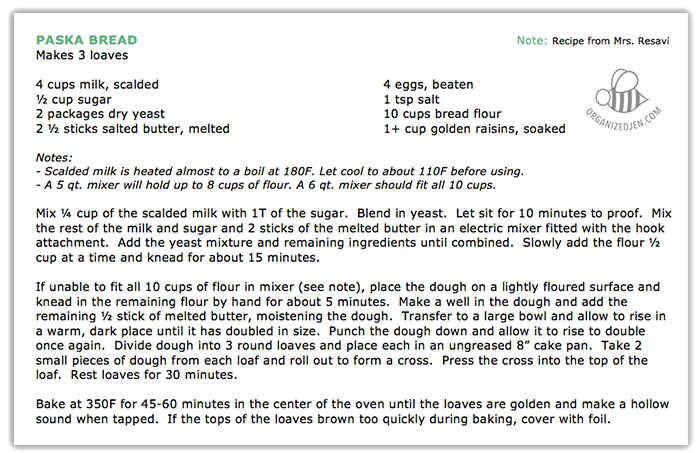 My mother-in-law, Suzanne, passed this recipe on to me when I married her son and I have baked it every Easter for the past ten years. The recipe is Slovakian in origin and was passed down to Suzanne from her aunt’s mother, Mrs. Resavi. It is a family tradition that I treasure and am proud to be able to continue and now share with you. Let me know if you decide to try out this recipe. Please feel free to send pictures via Twitter or Facebook if you do! I’d love to hear what some of your family traditions are when it comes to homemade food and what you’re planning on making for Easter this year if you celebrate. Looks amazing. I would love to try this but would need to half it since its just me and my husband for Easter. He loves hot cross buns so I know this would be right up his alley. Since your making of the video is ahead of Easter were you freezing these or making fresh ones on Easter weekend? Do you know if they freeze well? Thanks for sharing Jen. 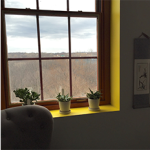 Love your cook nooks! I’m attempting to freeze them for the first time. This brings back so many memories of my grandmother’s paska, looks just like hers. Unfortunately I didn’t get her recipe before she passed, definitely going to try yours. Thank you for sharing!! I see the recipe calls for 2 and a 1/2 sticks of butter, but in the video you use Kerrygold, which I always use as well. Does one block of those equate to 1 stick of butter? Do you have the exact weighed measurements? Also, I like the pans you use in the video. Could you please tell me what store they can be bought from. Many thanks, I look forward to making this bread. I block of Kerrygold is equivalent to 2 sticks of butter. I used 1 1/4 block of Kerrygold in this recipe. It’s 10 ounces of butter. The pans were wedding gifts I believe from Williams Sonoma’s own range. That was 10 years ago now so I’m not sure they still offer their “gold touch” baking line. This looks yummy! Is this 2.5 sticks of regular butter stick measured, or 2.5 Kerry gold bricks?? I think kerrygold are 2 normal sticks. I brick of Kerrygold is equivalent to 2 sticks of butter. So I use 1 1/4 stick of Kerrygold in this recipe. These look absolutely delicious but I don’t think my mixer could handle the dough – it’s only a hand held mixer, it does have bread attachments but I’m skeptical about how they’d take on this dough! I don’t know if you have Hot Cross Buns in America but they’re one of our English Easter traditions and your Paska bread looks SO similar to them minus the glaze. You can knead this dough by hand as well. I only have 8 1/2 and 8 3/4 inches pan. Do u think it would be alright? I’m not much of a baker but would love to try this recipe out. Yes, absolutely. The loves might come out a tiny bit flatter. 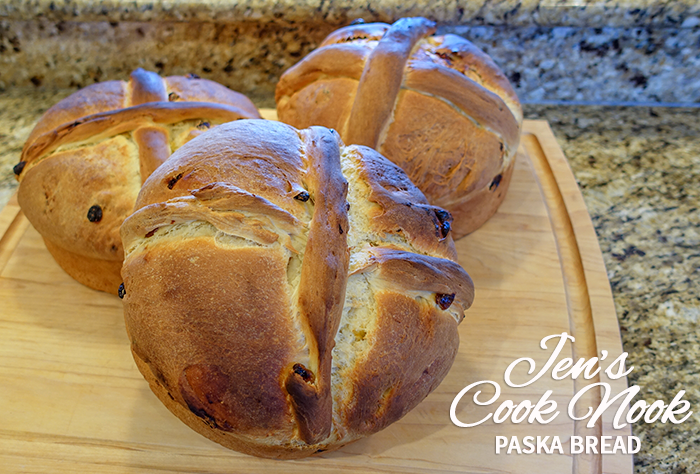 Jen- I made the Paska bread and it turned out amazing. I’m use to the Italian Easter bread but this turned out so much better. Thank you for the recipe and the detailed video attached, definitely took out the guess work for an infrequent baker. Looking forward to the next post. I always enjoy your cook nooks, Jen! I’ve been baking for a lot of years, but I learn something every time I watch you bake. Love your organized, methodical approach to cooking! Thanks for sharing this family recipe! Jen. I can’t wait to try this bread. Thanks for sharing. I saw your video about this bread from last year and tried to find the recipe. Thanks for sharing. It looks amazing and I can’t wait to try it. Love your videos! 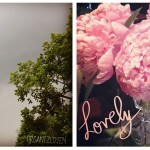 Thank you so much for sharing this lovely post &video! I m checking right now the video,I always enjoy to discover new recipes,and I m sure your Paska bread must be really deliious. Looks lovely! 🙂 I have a question, the butter, how much is 2 1/2 sticks in grams our pounds? I live in Sweden and we use the metric system so I doubt a stick of butter would be the same. Thanks! There are 4 ounces of butter in a stick, so 2 1/2 sticks is 10 ounces of butter or 283.5 grams. Hope this helps! Jen, my family isn’t a fan of raisins in bread. Would this bread be just as tasty without the raisins? Thanks and Happy Easter to you and your family. I think so, although I’m not sure if it would affect the baking process in any way. It’s worth a try! Thanks for sharing this recipe! I love family recipes. It is important to keep passing them down and to keep sharing the love. I find it incredibly insulting when people refuse to share recipes. Food is love. Share the love! I can’t wait to try this. Yum yum! Jen, Trying your recipe today. Having a link to a printer friendly version would be great. Thanx. Something I hope to work on in the future. Thanks for the suggestion! Made your recipe today. They turned out perfect. Only had 2 round pans so I used one square and it’s so cute. Thank your Jennifer! I made this recipe this year and it was very good. Thanks for sharing. My husband’s family is Slovak and they never wrote it down! My question is about the model of your mixer. I am going to break down and buy an electric one, tired of all the hand kneading. The reviews are all over the place. I want one that will knead dough as in your video, not overheat, and not rock on the counter. Your recommendation would be appreciated. Thank you. I have the KitchenAid Pro Line Stand Mixer – it’s a beast! It can handle double/triple recipes of cakes and cookies and kneads bread like a pro. Thank you, that’s the model I’ve been considering. Thanks for the affirmation. I just bought the 7 qt mixer based on your recommendation and that of Americas Test Kitchen. Made the Paska again, so yummy, and mixer worked well. Only one more question about the mixer, mine started to make a clicking sound as the dough got stiffer. Website says its normal but thought I’d check w you. Thanks for any feedback. Under your old site, http://www.organizedjen.com, the written recipe was located above your video.